Apart from the amazing nightlife that these beaches offer, the beaches in South Goa are known for the serenity and peace. The beaches in South Goa are different from the ones in North Goa regarding the crowd and food. There is not much crowd, allowing you to enjoy quiet moments with your loved ones. Ranging from water sports and adventure activities to shopping and bar hopping; the beaches in South Goa carry a charm of their own. South Goa is the part of Goa that has everything and is yet hidden from the mainstream Goan crowd. From the world’s most scenic sunsets to the best adventure sports opportunities, the beaches of South Goa have it all. With magnificent greenery and roomy shorelines, these beaches are nothing like the ones you have visited before. Here is a list of 10 famous beaches in South Goa for you to choose from, during your visit! 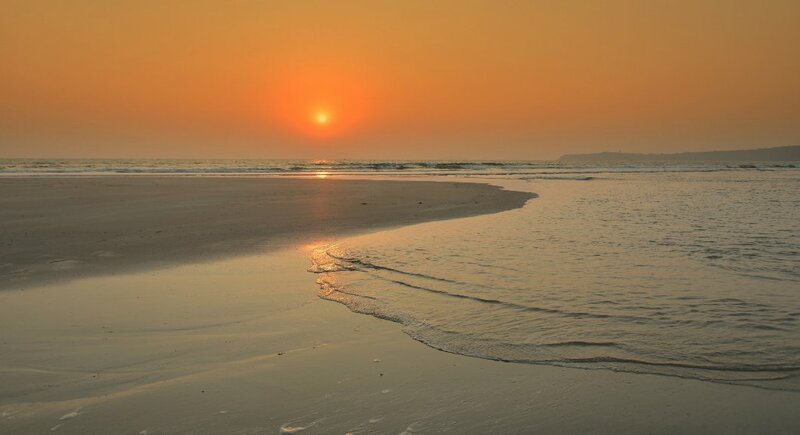 Only a 90-minute drive from the Dabolim airport, this beach is perfect for the tourists looking for peace and seclusion. Agonda is one of the most chilled out beaches in South Goa. You can spend your day sunbathing, swimming, relaxing, watching dolphins, or you can take part in watersports like paragliding and windsurfing. The adventure activities at Angoda Beach are some of the amazing things to do in Goa.Lost yourselves in the freedom of the sands and waters of this beautiful beach. Take a blissful walk along the coastline during the sunset time to experience luxury of a different kind. Agonda beach is one of the beaches in South Goa that you cannot give a miss! It is a gem in the crown of Goa tourism.The Colva Beach is located about 6 kilometers to the west of Margao, it is one of the oldest and most popular beaches of South Goa.You can spend a perfect morning sunbathing on the sands of Colva Beach without giving a care to the world. This secluded and serene beach in South Goa is truly one of its treasures. The twenty-five kilometers long stretch of coastline is made up of fine white sand, flanked by coconut groves on one side. A trip to the Colva Beach is never complete without a visit to the Menino Jesus statue. This architectural wonder makes Colva one of the best beaches in Goa. Known as one of the most pristine beaches in South Goa, Benaulim Beach. This enchanting beach is the perfect gateway for sun-lovers. Situated at a distance of forty-one kilometers from Panaji, this beach is also famous for his calming scenic beauty. Originally known as Banavli, it was renamed by the Portuguese who settled here. This is also the best place for indulging in adventure sports like parasailing, jet skiing, and windsurfing.Ranging from interesting water sports to bar hopping experiences, the activities to do in the Benaulim Beach are sure to pump your adrenaline to a whole new level! Among all the Goa Beaches, Betalbatim is one of the least crowded beaches in South Goa. This Beach is also renowned for the St. Thomas church. Nicknamed the Sunset Beach, the view of sun going down the horizon in the evening is one of the most breathtaking sights you will ever witness in your life.Relax on the warm sands of the beach, witnessing one of the most beautiful sunsets of your life, as you enjoy a chilled beer. This beach is one of those places in Goa which will take you to a different world. Located at a proximity from Dabolim airport, Bogmalo is a curved stretch of a sandy village, and also has a small fishing village. Bogmalo tops the list of best beaches in Goa because of its quaint surroundings and rural atmosphere. With parts fringed with coconut and palm groves, this beach is the perfect getaway for the tourists looking for tranquility and solitude. This is one of the most pristine Goa beaches where travelers visit because of the diving school. This school provides diving lessons to both amateurs and experts.Explore the gorgeous seabed of the Bogmalo Beach by indulging yourselves in the ever exciting scuba diving experience. The Cavelossim Beach is a perfect blend of black lava rocks and sparkling white sand. There are not many beaches in South Goa where one gets to hike and chill on the beach at the same time. Cavelossim is a small oceanside town in South Goa, with a few shacks along the coast, a quiet church, and colourful market stalls that are lined up along the main road. Situated at a distance of about twelve kilometers from Benaulim, it is known as one of the most serene shorelines of India. This Beach is famous for its incandescent beauty. Located about 2 kilometers from Benaulim, this beach is also one of the cleanest shorelines in Goa. The tourists here can spend their time relaxing amidst the quaint surroundings, looking at the serene boats along the horizon. The local food here is amazing and should add trying these delicacies to the list of things to do in Goa. Varca Beach is also the home of Indo-Pacific bottlenose dolphin. These water beauties inhabit the Arabian Sea waters and can be seen from the beach itself.Apart from these, this beach is beyond perfection for all the foodies out there! They host a wide variety of seafood stalls that serve amazing food at reasonable rates. One of the most popular beaches in South Goa, the Majorda Beach is full of palm groves. The soft white sand of the beach complements the wondrous greenery. The Ancestral Goa Museum is located at nearby Loutolim Village. This open-air museum features Goan life as it was hundred years ago. Majorda is also known for its toddy tapping business and the delicious restaurants and bakeries that are lined along the beach. Among all the places to visit in South Goa, Majorda Beach has its special place because of local food and drinks. Grab yourselves a chilled beer or a quirky cocktail and relax on the warm sands of the Majorda Beach. These sands provide a mini-heaven for all the beach bums out there! The Palolem Beach, located in Canacona, is one of the very few beaches in South Goa that hasn’t been spoilt by flocks of tourists. The beach pulls you in a warm embrace, with its rocky outfit covered by trees at one end, a part that is lovingly nicknamed as the Green Island. Palolem is one of the most beautiful places to visit in Goa. The inhabitants of this beach are the local fishermen and tourists who stay in the shacks. The Monkey Island is located at the North End of the beach. There is a low tide path that leads to this island. Visiting this island is an amazing experience that will take you over the top of the island.This peaceful beach in the land of South Goa will take you to a different world. Experience serenity like never before on the sands of the beautiful Palolem Beach. It has a 30-kilometre-long sprightly and picturesque beach strip situated on the Southern Coast of Goa, at the delta of River Sal. The area, protecting the fascinating beauty of nature, is also a National Park. The diverse ecology of Mobor Beach will make your Goa holidays really worth it. You could take walk on the soft and light sand, barefooted, and savour the delicacies served in the beach cafes. Mobor is one of the few beaches in Goa where you can indulge in a speedboat ride. You can also buy locally made trinkets from the beachside shops. Cola is well known for its lagoons and beach. This spectacular beach is away from maddening crowds. The perfect getaway especially if you are looking for some quiet time. Located about 15kms away from the Palolem beach, this beach is not easy to get to. One needs to walk past the hills to reach the beach. This is known as one of the hidden beaches in South Goa. Hotels and guest houses are available here. However, there is no transport available and travellers have to either rent a scooter or a car for their travel. Another lesser-known beach and this one snugly sits between Velsao beach and Utorda beach. The beach is an empty stretch and you will hardly find one or two small shacks around. If you are looking for a peaceful beach then this is the one. There are a few restaurants on the way to the beach. Transport might not be easily available so it is recommended that tourists arrange for their own travel. Rented cars or bikes are the best options. Hiring a cab is another alternative. Another one of the lesser known beaches, this one is again not easily accessible. However, the beach is quiet and has only a handful of visitors. There are hardly one or two beach shacks around. Transport is not easily available. The clean stretch of sparkling sand, clean waters and the fishing boats are a treat to watch. This beach lies further north of the famous Majorda Beach. This beach is not very well known and so has lesser crowds. The beach has some shacks with sun-beds and umbrellas for the travellers to use. The calm environs and the long stretch of beach is a treat. There are some multi-cuisine restaurants around which serve some good food. The Betul Beach is a pretty beach and it also is a fishing port. The place has a few resorts and a few nice restaurants serving some brilliant seafood. Again transport is a problem, however, if you have your own ride or car, then this is one beach that must not be missed. River Sal flows close by and the blue lagoon here is an absolute delight. This fishing village enjoys a nice climate year long and this makes it one of the pleasant beaches in south Goa. The beaches of South Goa have all the characteristics that are necessary to make your visit a perfect one. More serene and less-crowded than the rest of Goa, South Goa has an impressive nightlife and impeccable restaurants and resorts to make sure that you do not regret your stay here. So make the best out of your Goa Holidays and start planning your trip soon. Apart from these beaches, there are many other beautiful coastlines in this wonderful part of Goa. Right from partying to serenity, these beaches are some of the best places to visit in Goa. If you wish to experience different things in Goa, then these beaches are the right places for you. Ranging from the adrenaline pumping parasailing to the calm and quiet scuba diving, there is a whole lot of stuff to do at these beaches that will keep you entertained. If you are not in the drive for adventures, then find yourself a quirky beach shack and get involved in some amazing cocktails made by the bartenders! South Goa is the part of Goa that has everything, yet it is unexplored. Here is a list of famous beaches in South Goa for you to choose from.